The Metropolitan Opera first performed Il Trittico, Puccini‘s trilogy of one-act operas – Il Tabarro, Suor Angelica, Gianni Schicchi– in 1918, without the composer being able to attend because of wartime travel restrictions. The composer wanted the operas staged together, since among other things, they were modern scenarios on themes from Dante’s Inferno. Companies resisted the challenge of three completely different sets and three casts, and complete productions are rare, but the Met’s triumphant 2007 full revival is back, in full grandeur, due in no small part to the dazzling production designs, a vibrant orchestra and inspired casting. Clocking in at close to four hours, you can understand why companies chop this opus down, with Schicchi, the farce, most often programmed with other operas altogether. Aside from the productions’ set demands, the work is also taxing on the principal soprano when, as in this case, she sings leads in all three works, and soprano Patricia Racette is in such glorious voice all evening, distinctive in each of these roles. As Giorgetta who has a dockside romance in Il Tabarro, singing about “my life…between the bed and the stove”, she is as earthy and the direction is as gritty as a Kazan movie. 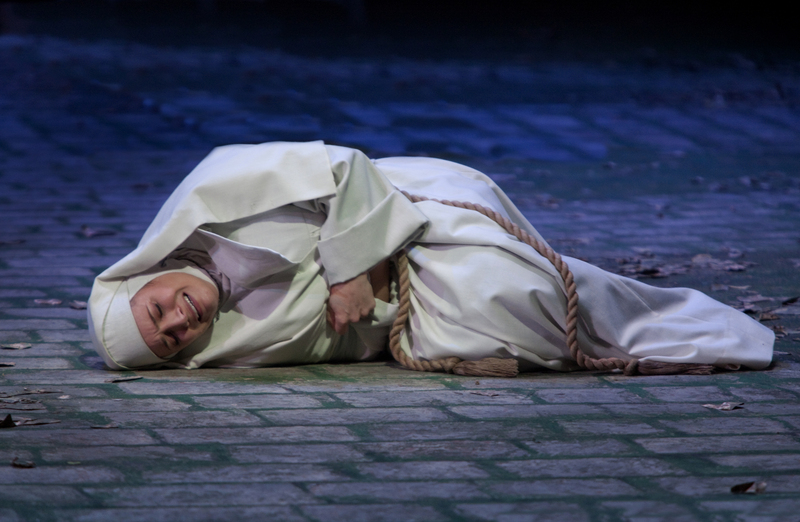 As the emotionally tortured nun in Suor Angelica, she her voices crashes in despair, when it is not otherwise imbued. By the time she is the lovesick Lauretta singing the eternal lullaby ‘Oh mio babbino caro’ in Gianni Schicchi trying to get her father to bless her engagement, Racette owns the Met. Technically, even with some vocal evaporation in Schicchi, this is an Olympic vocal achievement. The other vocal marathoner in Il Trittico is Stephanie Blythe, character singer par excellance, as the worldly Frugola reminiscing about a better life, the zany Zita plotting around the carcass of Baron Buoso. But, Blythe most arresting as the stony Principessa, Angelica’s aunt, who delivers the bad news about the fate of Angelica’s son, who was taken from her when she was banished by her family to the convent. In the revelation of the fate of her son, the audience seemed to freeze at her vocal heights, if not the violence in which she ripped her habit hood off. Conductor Stephano Ranzani, in a very impressive Met debut, was obviously very connected to the vocal performances, and otherwise a warm presence on the podium. Musically, the orchestration is fully ignited, Puccini’s characterizations and symphonic narratives vibrant and fleet. Ranzani maintains such balance projecting the disparate climates of these operas and cumulatively, vaulting the towering architectural spectrum of Puccini. Among the many performance highlights, In Tabarro, Aleksandrs Antonenko’s is the tender Luigi, the sousy dockworker who seduces Giorgetta. Racette and the tenor conjure instant romance and vocally are stratospheric. Zeljko Lucic as her husband Michele is equally heartbreaking, but casts a chilling baritone as one jealous husband who loiters with intent. The stage direction by Jack O’Brien, is a marvel of pacing and most impressive in Il Tabarro, with the cast looking like they’ve covered the waterfront, moving around with unfussy business that really tamps down the melodrama, for realism. On the flip side, O’Brien seems to revel in the vaudevillian shtick in Schicchi not above toilet humor or ‘slowly I turn‘antics among the singers. Speaking of lowbrow comedy, Alessandro Corbelli is a rubberface Schicchi, mugging as shamelessly as Harpo and full of vocal skullduggery as well. In contrast, the very fluid tenor Saimir Pirgu plays it straight for laughs as Lauretta’s earnest suitor. Douglas W. Schmidt’s set decoration is dazzling visual feast, particularly the river panorama of Il Tabarro. The cobalt shadows on stone streets, burnished wood of the barge and foreboding amber skies creates vivid atmospherics. The cathedral battlements of Angelica are stark counterpoint to the roiling emotions of the story and the cockeyed distressed villa interior in Schicchi is a comedy in itself.